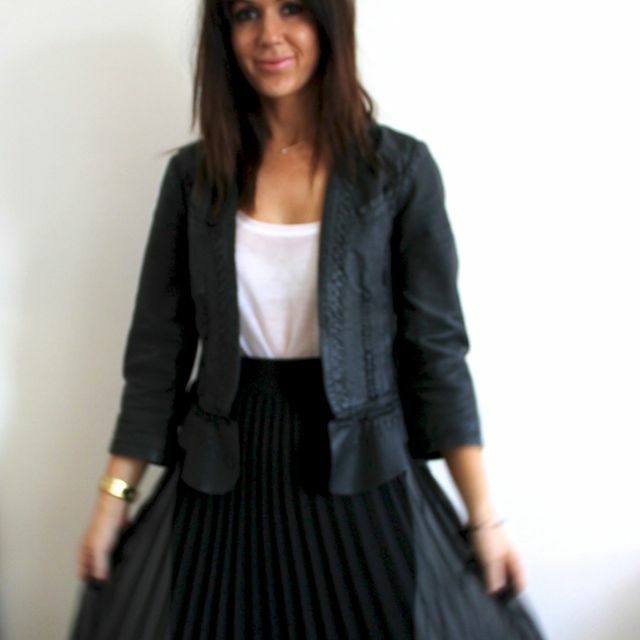 Verry pretty skirt and I still need that JACKET!!! I love that jacket and it needs to be mine:) Lol! I have just ordered one from Boohoo and currently noseying at topshop for a maxi skirt, never thought of river island! My problem is i'm only 5ft so they all drown me lol! @Crystal - haha i bless the day when I found this on the sale rack in topshop. they had a few at the time (a year or so ago now) and I remember being amazed that people didn't want it! LOVE! @EssJay24 - i hope you like it and yes River Island is fab! I like the pleats on your dress! It probably looks more flattering in person as the pleats add texture and movement to the dress, not to mention the lengthening effect of vertical lines. I bought a plain black maxi skirt from H&M last month for $17CAD and although it is a little see-thru in the sunlight (only has one layer), I'm really loving it. I've worn it on 3 occasions (once to work) and I love its simplistic elegance. I love the way it moves with me as I walk and I've got comments from people saying that it looks like I'm floating when I walk. Eerie or ethereal? lol. Does this happen to you? I have a maxi dress, but not a skirt. I think it looks better on you, my waist is high and I wouldn't want to tuck in my shirt. I think you look brilliant in it though! I'm not a fan of the maxi skirt. I think they look lovely on other people but just a no-go on myself seeing as I'm tall with long legs and they just seem to look completely disproportionate. They are a great effortless piece and you've styled it so well. @Dolly Daydream - thank you so much girl! Love it! Always tempted by sheer pleats - but worry about the washing/ironing situation!! The maxi skirt is definitely not something I'd be tempted to wear in a hurry (purely because at 5'2" said maxi skirt would fulfil the purpose of a maxi dress on me) but this one definitely looks gorgeous on you! Well done for being so brave, it's paid off! Lovely skirt! I too wavered on the maxi skirt and I've yet to find one that is just right. Many of them are too short (I'm 5'9") so they end up making my legs look stumpy. Dresses and skirts though have been my new favourite types of clothing. So comfortable! Jeans now feel like sausage casings in comparison! @Blush crush - eek i don't know. i have seen some lovely scalloped edge flats in Topshop that would look lovely....i suppose boots? it's tricky! Looks amazing on you! Love it! This looks gorgeous on you! 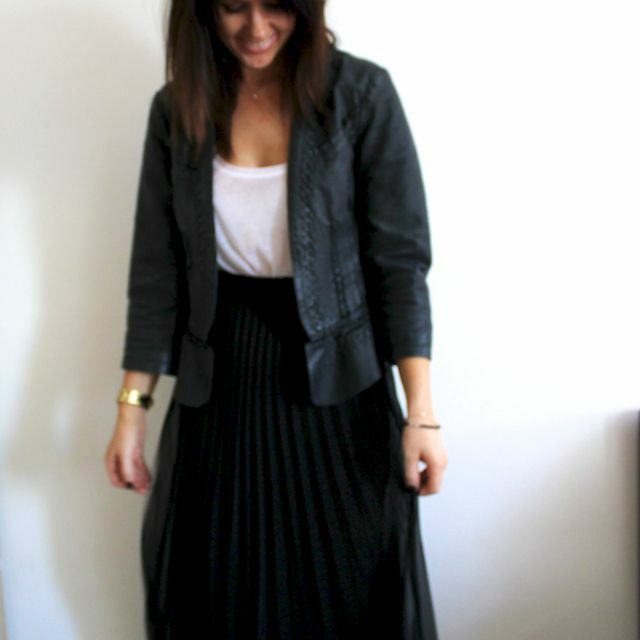 I definitely love maxi skirts, that being said though, I don't actually own one at the moment! I am a big fan of this trend. I love it and find it so easy to wear. I've always been hesitant to try a maxi skirt because I assumed it would make me look short. Maybe I'll try one on next time I go shopping. I really like the skirt you bought- love the pleats! I actually got the one from Topshop and I love it. I saw some in yellow and pink and even though I love how they look on other people I'm not sure I would wear those colours myself. Maybe...we'll see. This one looks very nice! i love the waistband and the way this maxi skirt is pleated. it looks lovely paired with the plain white tank. Looks lovely on you. I vote for same shade black tee/tank. I'm only 5'2 and they really don't flatter short frames with a bit of hip. But I'm ok with admiring from the side. that one is gorgeous, although i do like the lighter version on the site too. but either way, im so excited for fall when i can pair maxi shirts with gorgeous chunky knits! it will be amazing. I have a few including a pleated coral number from Warehouse which is beautiful but a little see through! I just love how they feel swishing around as I walk though. Looks fab! Ide love to be able to wear one, unfortunately im abit short. Maybe ill find a perfect one someday! You have deffo made me think about getting one tho! There is one I REALLY want from zara - but it's about £40, which is outside my budget for a skirt I would only occassionally wear. I do love the trend though - so girly. Have always wanted to purchase one but I always feel redic when I try them on. Maybe I am too short, looks good on you though! Gorgeous. I envision it with cowboy boots. Love! I had a Princess Diana moment - didn't realize my maxi skirt was see-through, despite it's built-in slip…which was sheer :\ I walked around in it all day, and my work place also had gigantic windows that had sun streaming through it! Oh well, I loved this pink skirt, quite pretty... and I learnt to wear a slip now! I'm too short to try maxi skirts and dresses! and too apprehensive to try them with heels. I'll trip, I just know it lol. You make me want to be one right now!!! Beautiful yet such a simple outfit! If i am not mistaken this looks rather like a more purse friendly 'carrie' if only they did it in red it would stop me drooling on the whistles site. Laura, I adore every different look of you! You are absolutely stunning in the maxi skirt and in black.